Skye is one of the newest Squarespace templates, released in February 2016. As such, it is one of the new breed of templates, which means it has a greater level of control than most of the older templates, many of which were developed several years ago. Skye was released at the same time as two other templates (Tudor and Foundry) and are identical in terms of the controls and features available. Since then, Squarespace have released two more templates in this family, Indigo and Ready, and they have grouped them all together under the moniker "Skye family". The Skye family has been designed specifically with bloggers in mind. There’s also another family of blogger templates, comprised of the twins Farro and Haute. Altogether, I call these the “Blog-Booster” templates, since they are designed specifically for modern blogs. This means that you will have far more control over the way your blog home (list of your posts) and your individual blog posts pages look and function. And because many bloggers also sell products, the Blog-Boosters also have a great deal of control over the Product pages, too. Why choose Skye instead of Tudor, Foundry, Indigo or Ready templates? As there are so many controls with this new breed of template, you’ll definitely save yourself some time by choosing the template that most closely matches the look & content you want for your own site. 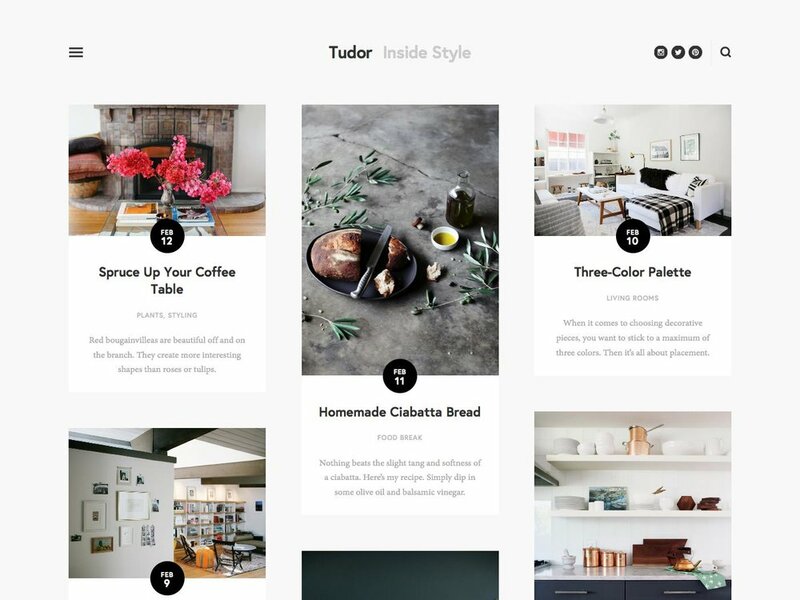 Since there are no differences in the controls available, you could – in theory – start from Ready and end up with a site that looks exactly like Tudor, just by adjusting the style settings and page content… but that could take a lot of time. If you are considering using any of the this template family, take a good long look at all of the key pages in all of their demo sites, and pick the one that most closely matches the layout, style and content of your own website. Remember that just because the Skye family templates have great blog-friendly features like an About the Author box, they can also be used for business or other types of websites, too. One point to note is that the Skye navigation is hidden in the "burger" (those 3 lines you normally only see on mobile views of websites), so if your clientele is of an older generation, they might never find the navigation (something I have found in usability tests), so beware! I'd love it if the burger nav could be turned on/off like in the Adirondack and Bedford templates, but sadly that's not possible with Skye (as of the time of writing, anyway). Strong Point / Best For… Visually-led blogs with lots of posts, who want a high level of design control. Also good for e-Commerce. Design Notes Centred canvas with transparent header and multiple nav areas. Huge amount of style controls, especially for Blog and Products pages. Header Transparent sticky header that stays visible as you scroll. 3 areas within the header: nav on the left, branding in the middle, icons on the right. Choose icons: social and/or search. If you have a products page, cart icon will show permanently. Site Tag Line Yes, can choose to show below logo, or hidden. Main Navigation "Burger" navigation (3 lines, traditionally used on mobiles), which expands a vertical panel when opened. Can have content in a second vertical panel next to the nav panel if desired. On mobile & tablet view, the left/right side elements move to a sticky nav that appears in the bottom of the screen. Other Navigation Secondary nav in footer, at very bottom (below other footer content). Social Icons Top header right, or hidden. Can set size, style and color. Blog Notes Blog snippets show as grid in blog home, with many options to show which elements and how they display, including a callout circle on the date, or a masonry-style grid. Can show an Author Profile at the bottom of post or in sidebar. In posts, images can be set wider than text content. Post navigation at the bottom, plus cute pie-chart indicator showing how far down the post you are. A related posts block appears at the end of each post, and sticky next/previous post nav arrows show on individual post pages. No locations. Other Features / Notes Can set styles of image captions and newsletter blocks. No mobile styles aside from a couple for the blog.